Claude Monet, the most famous of the Impressionist painters, spent some of his most productive and artistically important years living in Argenteuil, a village along the Seine River, northwest of Paris. Monet lived in Argenteuil from 1871 to 1878; this was a period that saw many Parisians visiting the rural town as an escape from the busy urban Paris. 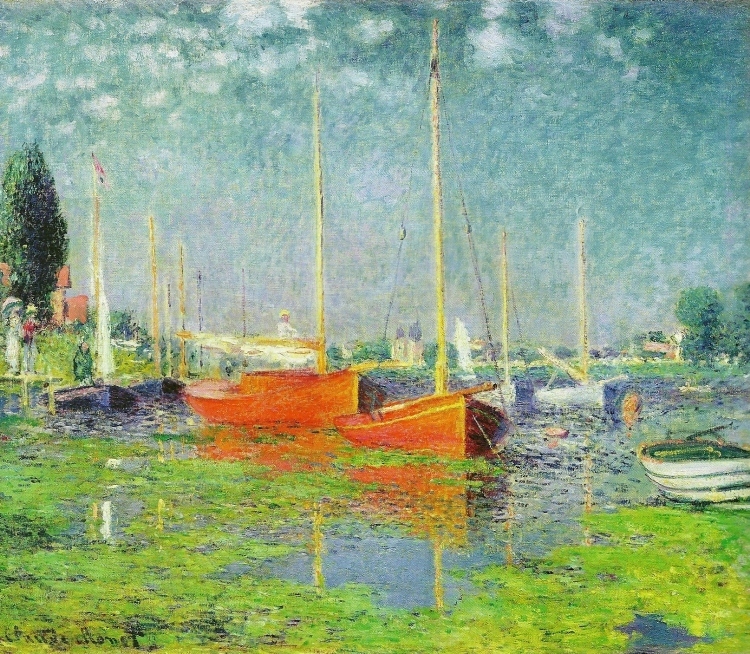 Monet wasn’t the only painter who recognized the beauty of Argenteuil. Fellow painters like Auguste Renoir, Georges Braque, and Edouard Manet also painted scenes of Argenteuil. During his time in Argenteuil, Monet painted many scenes of the landscape, its water, and its people. 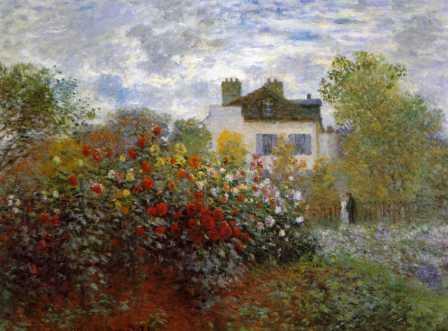 In The Artist's Garden in Argenteuil, Monet shows a white French house, surrounded by trees, its view obstructed by flowers, including Dahlias, in full bloom. The sky is blue with clouds back lit by a bright sun. Monet painted the railway bridge in The Bridge at Argenteuil. He must have enjoyed this subject matter so much he painted it four times. In Monet’s The Bridge at Argenteuil he shows the arches supporting the bridge to the right, receding into the distance. In the bridge paintings, the sky is blue, but in varying shades, depending on the painting. To the viewer’s left, Monet painted a boat, floating leisurely in the calm water. For Monet, Argenteuil was a place to relax and enjoy life at a slower pace than in Paris or London. His paintings show that attitude. In 1875, Claude Monet painted Argenteuil, a more complex composition still showing the slower life that a small town can celebrate. As in many paintings he did of Argenteuil, Monet shows a water scene. The sky is blue, yet dusted with white clouds. In the background there are tall trees with the hint of trees farther beyond the water. The foreground is filled with the green of water plants. To the left, he shows a couple out for a stroll – a favorite activity of those spending a day in Argenteuil. And in the center, the focus of the composition, he shows two red boats, their sails down, and anchors dropped. Monet’s Argenteuil has a lot in common with many other paintings he did. Throughout his career, Monet was experimenting with the effects of light on how a viewer perceives color. In Argenteuil, Monet continues that with the purple hues in the water and the shimmering light in the sky. Here in Argenteuil, however, Monet is perhaps more focused on showing the relationships color can have with each other. The rust red of the boats and their reflections contrast against the blue of the water and sky and the green of the plants surrounding them. That is exactly what Monet does in Argenteuil. The masts of the sail boats are made up of yellow streaks sitting atop the white and blue hulls in the distance. The two figures walking are brushstrokes of white, barely defining the form of the people, but enough so to show their shape. One of Monet’s biggest achievements as an artist was his masterful understanding of the relationship between light and color. His paintings in Argenteuil, including this one, are among the best examples of that.